Get used to seeing this image over the next week. 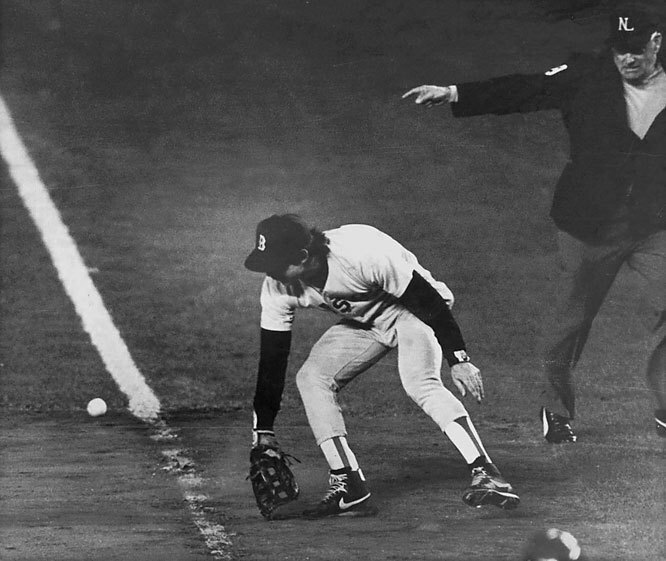 In case you live under a rock, this is from the 10th inning of Game 6 of the 1986 World Series, when Bill Buckner let a grounder from Mookie Wilson get through the infield allowing the winning run to score. Before that happened, the Red Sox had a 3-2 series lead and even a 5-2 lead at the start of the bottom of the 10th inning and it looked like they had the game and the series locked up. The Mets scored 3 runs in the bottom of the 10th (the last one being on the play above) and went on to win Game 7 two days later. So while this post has mostly been about one guy for the other team, a lot can (and should) be said about the 1986 Mets. Managed by Davey Johnson, they won 108 games and the NL East division. In the 10th inning of a game on July 22 against the Reds, 3B Ray Knight got into a bench-clearing brawl with Eric Davis and both were ejected, along with two other players. Without enough players, Davey Johnson had to put pitchers Jesse Orosco and Roger McDowell in the outfield for 3 innings until Howard Johnson (the player, not the hotel) hit a go-ahead home run to eventually win the game. Another weird note, Eric Davis was pinch running in the 10th after Pete Rose (who was a player AND the manager) got a single. And here we are, 29 years later, with the Mets set to take on the Royals in the 2015 World Series. Who do you think will win? And be sure to follow Mendys Baseball on twitter!